Today in the UK, the number of rail passengers – we are repeatedly told – is at the highest its ever been, and there has been rapid expansion over recent years. As an arch-sceptic on statistics, I wonder what ‘truth’ lies behind these reports. In the area where I live, the volume of cars on the local roads is much more today than say 30 years ago – and yet the local economy has declined, with fewer industries. Many of the cars on the roads have only a single occupant, where do they go where do they work – has the ‘school run’ replaced the trip to work at the factories that have either closed, or been reduced in size. Passenger numbers have indeed increased – in some examples quite dramatically. The statistics record passenger kilometres travelled, and comparing both the rates of increase over the past 10 to 15 years with our European neighbours shows some interesting contrasts. It may be that the number of passenger kilometres would increase because there are many more commuter – short distance journeys – not that passengers are travelling further. The UK still has a long way to go before it catches up with France and Germany – each of which have commuter journeys in and around major cities – but since around 2010/11, it has grown at an increased rate. Comparing the numbers from 2017, the UK has seen passenger-kilometres rise by 13% over 2012, and by 37% since 2007. For France these same figures are 6% and 18%, whilst in Germany these numbers are 2% since 2012 and 21% since 2007. It is a complex picture in the UK, but it is clearly true that passenger numbers and certainly the distances travelled have increased significantly – which does perhaps underpin a lot of the reports and experiences of overcrowding on many services. There is though marked regional variations across Network Rail’s infrastructure, and the development of a strategy to improve transport in the North of England especially is clearly essential. Currently, the only movement in that direction in the past couple of years has been the Northern Powerhouse and Transport for the North – but in 2019, this connects across the M62 road corridor, and North East cities such as Leeds, York and Newcastle. HS2 and HS3 are still essentially at the drawing board stage, and for rail passengers, the lack of progress there may be a reason for the fall off in passenger growth since 2014. Yes, I know, statistics can be used to explain a variety of pros and cons in advancing the cause of rail transport and investment, but I had wondered for some time why, in an area I am familiar with, there seems to be more cars, lorries and vans on the road and industry and population has fallen. Things were equally complex when it came to fixing track, and general repairs and upkeep of the infrastructure, where various subcontractors in the supply chain offered civil and mechanical engineering services, and often with more than one company competing for a contract. I imagine in any business, when multiple suppliers and multiple contracts are involved for either the same, or ongoing maintenance work, managing those suppliers can be a heavy cost burden on the business. The overall idea that the degree of fragmentation applied to a single business – i.e. running a train on a piece of track from ‘A’ to ‘B’ – could reduce operating costs, through increased competition to provide goods and services is clearly false. In 2017/2018, there were 23 – well 24, but one of these lost their licence to run trains in the summer of 2018 – train operating companies (TOCs) across the UK rail network. Some passenger services were transferred to the devolved governments in Scotland, Wales and Northern Ireland, and then there were the old PTE style operations for metropolitan areas like London and Manchester. All of these train operating companies received some form of subsidy from central government, part of which is the network charge, to cover their share of costs relating to the fixed infrastructure, with the rest a payment to run services. In the majority of cases the income charged through ticketing, whether regulated, off peak, peak, or any other form, does not cover the costs of franchising. Some of the operators’ do not of course get franchises awarded, or are contracted to provide services by franchise from central government. These are either ‘open access’ operators – who run trains on specific routes if and when timetable paths permit – whilst others simply run from one station stop to another, such as the Heathrow Express or Gatwick Express. On top of this there are of course the cross channel Eurostar services, which do not have a franchise agreement with the UK government, and is owned and operated by its French, Belgian and Hermes Investment Co owners. Looking at the above, there is a 50:50 split between profitable and loss-making operations. But only if you leave out the subsidy paid to each operator to cover the infrastructure (network) support and maintenance where they run their trains. If you include the network support grant element, none of the operators in the list above generates positive figures. So, do we accept that separating infrastructure from operations has not really improved either cost of services or performance, but simply shown that some regional rail services are just more expensive to run than others? No real change from the 1960s, 70s, or even in the 1980s when investment levels were really poor. The past couple of years has seen a lot of controvwersy over extending, cancelling or re-bidding for various franchises, and some of the existing franchises will not end for another 6 years. Subsidies for the TOCs look set to continue for some time according to the Dept. For Transport’s Franchise Schedule. At the same time as the North Western Railway secured its Act, the Morecambe Harbour & Railway Company was planning to build its own line from the harbour at Poulton-le-Sands, (as Morecambe was then known) to Lancaster. 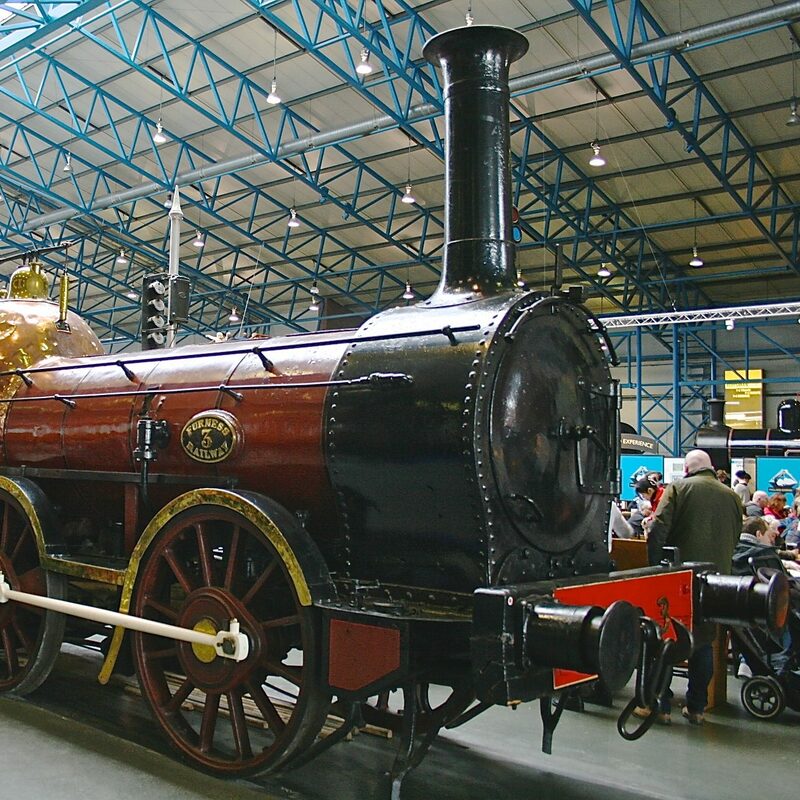 The Morecambe Act was approved on 16th June 1846, two weeks before the North Western Railway secured its own Act. However, the Morecambe harbour company was more focussed on gaining increased revenue from harbour dues that coastal shipping and ferry trade offered, and its line was ‘handed over’ to the North Western Railway even before construction started. In addition to the line from Morecambe to Lancaster, the Harbour Company’s plan also included a proposed connection to the Lancaster & Carlisle Railway near Hest Bank, but this was dropped in 1849, only to be resurrected under the LNWR some 10 years later, and completed in 1864. The ‘Little’ North Western proposal from Leeds to Lancaster’s main purpose was to carry its produce from Leeds and Bradford to the west coast ports and main line railways, and unsurprisingly, the company’s head office was at 22 Commercial Street, Leeds. Here was the northern end of the North Midland Railway in the 1840s, and George Hudson’s territory for his grand plans for the York and North Midland, and expansion westwards to Liverpool and Manchester. However, the ‘Little’ North Western came to connect with the Leeds & Bradford Extension Railway, which was absorbed into the Midland Railway in 1851, and the ‘Little’ North Western leased by the Midland from January 1859. The original terminus of the Morecambe Harbour & Railway Company was on the wooden jetty at Poulton-le-Sands, which was later replaced by a stone structure. The present day “Midland Hotel” was originally known as the “Morecambe Hotel”, and the stone jetty marked the western boundary of the harbour. A more ‘conventional’ station, with an overall roof was built at Northumberland Street, as the railway’s passenger traffic grew, along with a hotel to serve travellers for Douglas and Belfast. The line did actually end on the jetty, with a long, low building designed and constructed to allow goods to be offloaded rapidly from ships on to the waiting trains, before setting off on their eastward journeys. The building actually lasted around 90 years – into the 1930s – although shipping had ceased after the loss of traffic to the Furness Railway, and from 1904, following the opening of the Midland Railway’s harbour at Heysham. One of the major problems with Morecambe’s harbour was the range of the tide, resulting in the Midland Railway transferring sailings to Piel, near Barrow, on the Furness Railway. In 1867, the direct connection with the Furness, from Wennington was completed, connecting with the Lancaster & Carlisle at Carnforth. The new ‘Furness & Midland Joint’ line allowed the Midland to transfer its ‘boat train’ traffic from Poulton to the Furness Railway jetty at Piel, which was independent of the tide, and provided a better option for the Midland Railway. The Midland and Furness companies, together with James Little & Co., as equal shareholders, jointly owned the IOM steamers. The Furness Railway began construction of its extensive docks at Barrow in 1867, and created a new station at Ramsden Dock, specifically for the steamer traffic to the IOM, Ireland, and even America. The Midland continued to operate all its Irish and other seaborne traffic from either Piel or Barrow until 1893, when it duly gave notice of its intention to cease that operation. The first mention of a harbour at Heysham was included in the Act of Parliament obtained by the ‘Little’ North Western in 1849, the same year that saw approval for the connection between Green Ayre and Castle stations in Lancaster. However, it wasn’t until 1897 that the Midland Railway – by then effectively owners of the ‘Little’ North Western – bought the land to build a new deep water harbour, to provide greater reliability for their cross-sea traffic. The site chosen was at the southern end of Half Moon Bay, with a branch line connecting to the original line at Torrisholme, with access from both Morecambe Promenade and the lines to the harbour, as well as directly to Lancaster Green Ayre – in effect the ‘Torrisholme Triangle’. There was a 4 year delay after giving notice to the Furness of its intention to cease running boat trains to Barrow, but after spending £3 million on a new 350 acre site, construction was completed and the new harbour with its rail connection was opened in 1904. Just after the turn of the 19th to 20th centuries, the original station at Northumberland Street was replaced by the impressive Morecambe Promenade station, and a curve linking the LNWR line to Morecambe via Bare Lane was completed. This longer route from Lancaster Castle provided the LNWR with access to its own station at Euston Road – only a very short branch from the Midland’s line. Yet another connecting curve was made from the LNWR’s Bare Lane route to the main line at Hest Bank, which enabled trains from the north to access Morecambe directly, these changes collectively known as forming the ‘Torrisholme Triangle’. By far the most far-reaching change was the announcement in 1906 that electrification of the line from Lancaster Castle, to Green Ayre, and on to Morecambe Promenade. At that time Richard Deeley was the Midland Railway’s Locomotive Superintendent, and this work would have been seen as we today look at the use of ‘new technology’ in industry. This work built on the successful use of electricity at the recently opened Heysham Harbour, where the Midland’s own power station was supplying power to dockside cranes and other equipment. Throughout its life, the ‘Little’ North Western arm of the Midland Railway, and well into BR days, passenger traffic was typically the holidaymakers from the east, and Yorkshire in particular, which together with day trippers and local traffic from North Lancashire was certainly popular. To a degree it was also quite cost effective. For example the new station at Scale Hall, which opened in June 1957, was expected to pay for itself in 7 years, but it achieved its target in half of that time, only 3 ½ years – even before the ‘Beeching Report’ was published. It wasn’t just holidaymakers though, as businessmen from Leeds and Bradford were provided with a ‘Residential Express’ by the Midland to transport the wealthy wool merchants and manufacturers from Yorkshire to their homes at Poulton, and for a time, the service even included a ‘Club Car’. After nationalisation, passenger numbers remained largely unchanged, and Morecambe remained a popular holiday resort, but like most UK resorts was dramatically affected by the growth of foreign holidays, and cheaper flights to destinations with guaranteed sunshine. In terms of pure passenger numbers, in 1962/63 Beeching records these as 50,000 per week on the Lancaster to Morecambe line, but only around 5,000 a week on the ‘Little’ North Western route, along with the line from Wennington to Carnforth. Density of freight on the other hand was an interesting picture, with 50,000 tons a week for the Heysham, Lancaster to Skipton and Leeds – at least it was justification for the original reasons for the building of the ‘Little’ North Western line, with access to the port of Heysham. Tonnage by station on these routes was much more varied, and perhaps as expected, places like Halton, Wennington, etc. delivered between zero and 5,000 tons. Again though, Lancaster, Morecambe and Heysham generated between 5,000 and 25,000 tons a week. Heysham was listed on Map No. 11 of the Beeching Report as one of the terminals for the ‘Liner Train Routes’ being considered by BR at that time, and so perhaps its future was assured even during that dramatic period. In fact daily liner train services were operated between London, Birmingham and Heysham in 1968, as the national freight strategy was set to be expanded with a £12 million investment in new terminals and routes. In the infamous “Beeching Report” 13 stations were scheduled for closure, and the Lancaster Castle, Green Ayre, Morecambe and Heysham service was to be stopped, and the route closed completely. Green Ayre was perhaps the largest casualty, along with the electrified line, and Morecambe’s Euston Road station. The latter was in a derelict state for many years after the line closed, until the site was cleared and redeveloped. There is little doubt that the decision to withdraw and modify the Leeds to Morecambe services contributed greatly to the once famous seaside town’s decline, although the freight services to Heysham continued, the economic prosperity of the area suffered badly. On the 3rd January 1966 the passenger traffic ceased on the line, four months later the locomotive and goods depots closed, including boat trains to/from Manchester, Birmingham and London and ” The Ulster Express”. In May 1966 the locomotive and goods depots closed, and with the withdrawal of all traffic on the remnants of the eastbound track from Green Ayre in 1976, the station and remaining yards were demolished. Click on the image below to load a more detailed review of the lines between Lancaster, Morecambe and Heysham, services, locos and rolling stock.